Val & Kar rent a car company offers you cars (manual and automatic transmission), vans, 4x4, passengers transfers to Haskovo Mineral Baths 24/7/365. We can support you with the vehicle you need depending on your needs and requirements starting with a small town car, moving further with economical rental cars, vans and coaches for all sorts of transfers, business cars, SUVs etc, protected with fully comprehensive insurance . The safety of our trip is guaranteed by our mechanics, who take everyday care for the vehicles. Location: Haskovo Mineral Baths is a famous Spa resort, located at the northern foothills ofthe East part of Rodope Mountain. It is 18 km west of Haskovo, at 280 m altitude. There are many archeological finds from the prehistoric age, ancient and medieval times, found in theregion. They prove that the mineral springs in Haskovo Mineral Baths were used for centuries now. SPA and Climate: There are 15 hot mineral springs in the region. Their temperature varies from 54°С to 56 °С. The climate is temperate continental under Mediterranean impact. There are more than 1200 sunny hours per year that makes Haskovo Mineral Baths one of the sunniest regions in Bulgaria. The hot mineral waters, the sun and the gentle climate have very favourable influence over the human constitution. Recreation and Entertainment: The resort offers a great variety of sport and recreational facilities. There are parks and prophylactic zones at a disposal of the guest. The visitors can see the picturesque vicinities of the resort and to take a trip to the nearby town Haskovo. 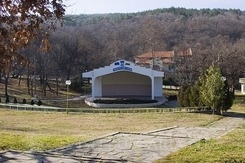 Many visitors to Haskovo are drawn by the town's mineral springs. The Haskovo Mineral Springs are known for their healing and restorative properties. Be sure to visit nearby Kanane, a park set amidst a huge oak forest. In Kanane you can dine in the restaurant, play tennis on the well-kept courts, or spend time on the picnic areas. You might also think about staying in one of the hotels located inside Kanane Park. Many hotels offer in-house restaurants, bars, and some even have delightful pastry shops where you can get treats for breakfast. The Haskovo Ethnographic Museum is housed in the former Paskalev's house. The home's architectural features are stunning, but the contents of the museum inside offer an in depth look into the clothing, equipment, and cookware of times long past.